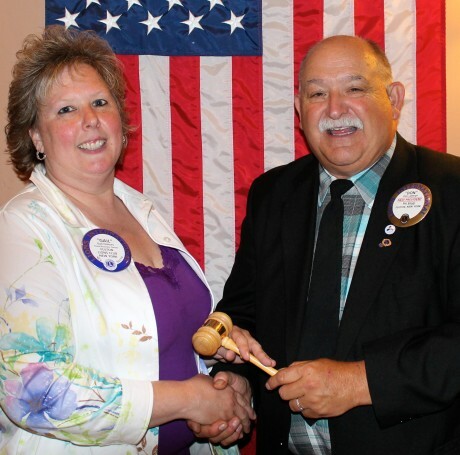 The Fulton Lions Club installed its new slate of officers for 2014-15 and presented club awards for the 2013-14-club year at their June 13 meeting. In addition, Paul Foster was honored by Lions Clubs International for his 40 years of membership. Gail Holmes succeeds Donald LaBarge as president. Other officers installed included: Dave Morrell, second vice president; Leo Chirello, third vice president; Michele Standard, secretary; and Roberta Boeteler, treasurer. Other officers installed include: David Dingman, membership chair; Zach Merry, assistant secretary; Ron Browning, assistant treasurer and lion tamer; Roberta Boteler, assistant lion tamer; Brett Tallents, tail twister; Steve Chirello, assistant tail twister; Paul Foster and Fred Aldrich, two-year directors; and, Robert Weston and Steve Chirello, one-year directors. Lion Robert Seibert of Liverpool, past Lions Clubs International director and past district governor, presided over the installation. Fulton Lion Paul Foster, left, is congratulated on 40 years as a Fulton Lion by club President Don LaBarge. Foster, a past club president, deputy district governor, and two-time zone chairman, received a certificate of recognition for 40 years of service from Lions Clubs International President Barry J. Palmer. 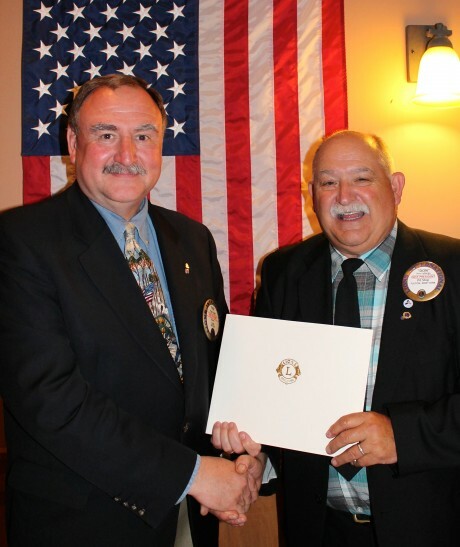 Foster, a past club president, deputy district governor, and two-time zone chairman, received a certificate of recognition for 40 years of service from Lions Clubs International President Barry J. Palmer. “Chartered in 1953, our club continues to be the largest and most active in our district. We look forward to our annual Duck Derby—which is Sept. 7 this year instead of Labor Day—to kick-off our next year of service to the greater Fulton community and our annual Lions Loot Sweepstakes, which will now be held in April 19, 2015,” Holmes said.